A University of New Brunswick researcher examining ways to monitor prescription safety for the elderly is a top winner of the New Brunswick Innovation Foundation’s R3 Research Innovation Awards. Dr. Carole Goodine, a visiting research fellow at UNB’s Institute of Biomedical Engineering, was awarded $50,000 in NBIF research funding as one of three top winners of the competition. At a gala ceremony, Thursday night at the Fredericton Convention Centre, she also received the CBC Viewers’ Choice Award, giving her another $15,000 in funding. The competition focused on innovations in aging. Also receiving $50,000 in funding each are Dr. Suzanne Dupuis-Blanchard of the Université de Moncton for her research into innovations in home care and St. Thomas University’s Dr. Clive Baldwin for his work on developing narrative care. Dr. Trevor Hanson, associate professor of civil engineering and a member of the UNB Transportation Group, and Dr. Erik Scheme, assistant professor of electrical and computer engineering and a researcher with UNB’s Institute of Biomedical Engineering, rounded out the top five finalists heading into the evening’s awards. Dr. David MaGee, vice-president of research at UNB, congratulated Dr. Goodine for her success and applauded all the finalists, including Dr. Scheme and Dr. Hanson. Dr. Goodine and her team are developing a smartphone app to address polypharmacy – the administering of multiple medications simultaneously. With hundreds of medications considered to be high-risk in older adults, tools to identify potential concerns could avert health issues for patients. Dr. Goodine, who is a pharmacist at Horizon Health Network and a researcher at York Care Centre in Fredericton, says more than 60 per cent of nursing home residents take more than 10 medications, while patients on more than five medications have a higher risk of side effects and drug interactions. “When clinicians are reviewing medications, they have to identify those that pose higher risks. Automating this process will quickly trigger which medications should be used carefully in older adults,” said Dr. Goodine. She says that her work was inspired by witnessing first-hand the positive effects of prescribing fewer medications. Dr. Trevor Hanson’s research looks at the mobility issues of rural seniors that can’t or don’t drive. His team is developing technical planning and forecasting tools to support rural transportation. His team is currently focused on understanding the role that non-profit volunteer driver programs play in the transportation system. Dr. Erik Scheme is developing PITCH – Proactive Integrated Technology-Enabled Patient-Centric Healthcare. The idea is a comprehensive screening program that will enable regular and proactive health monitoring and intervention, translating into better health outcomes and lower health-care costs. For more on the UNB innovators and their research, see the UNB Newsroom. 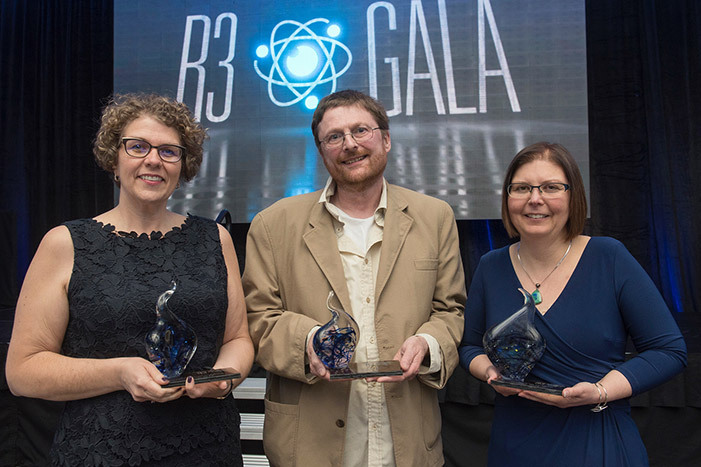 Photo: NBIF research funding winners Suzanne Dupuis-Blanchard (Université de Moncton), Clive Baldwin (St. Thomas University), Carole Goodine (University of New Brunswick). Photo: Stephen MacGillivray Photography & Video.